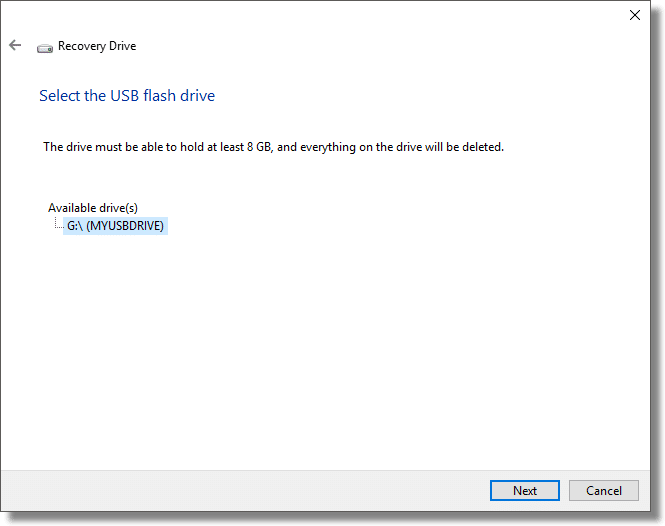 Create a Windows 10 Recovery Drive - Ask Leo! 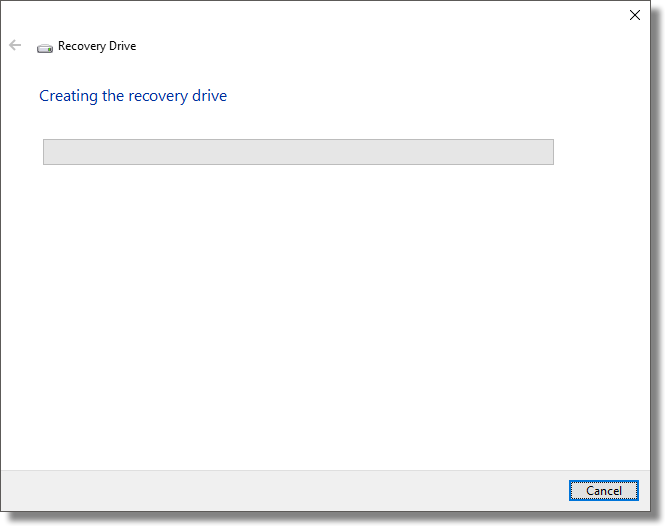 A Windows 10 Recovery Drive can be used to restore Windows backups to your machine, and more. I'll show you how to create one. In a previous article, I showed you how to create a backup image using Windows 10’s built-in backup program. Along the way, we were prompted to create what’s called a “Recovery Drive” to be used in the event of a disaster from which you wish to recover. You don’t have to be taking a backup image to create a recovery drive, and it’s actually convenient to have around; it can take the place of your original installation media should that not be available. 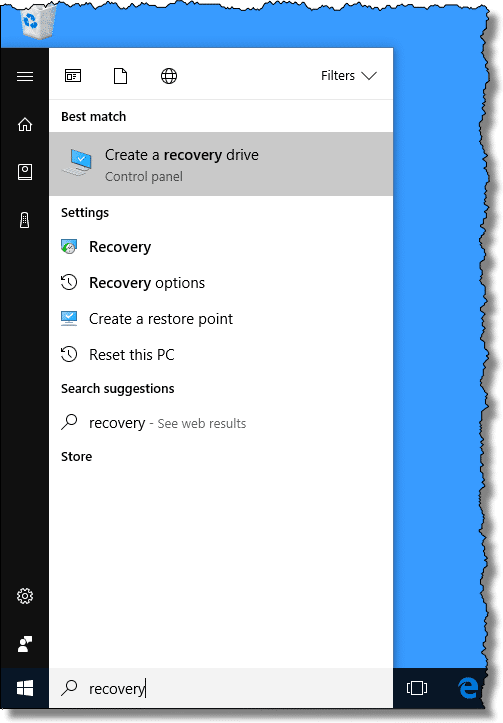 Click on the Start menu (or type the Windows key on your keyboard) and begin typing “recovery drive” (without the quotes). The first search result should be “Create a recovery drive”. As soon as that appears, click on it. 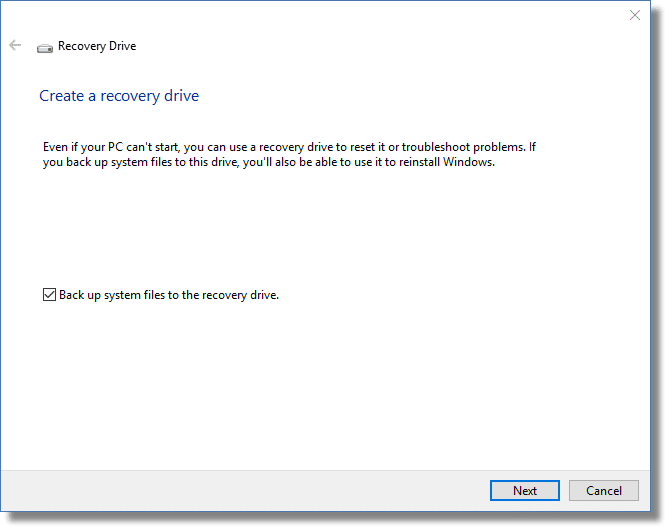 After confirming UAC (not shown), you’ll be presented with the Recovery Drive wizard’s first screen. Make sure that “Back up system files to the recovery drive” is checked. This may require a larger flash drive, but ensures that you’ll be able to reinstall your system from scratch using this drive, should the need arise. The wizard will then scan your system for eligible USB flash drives. If you have not yet inserted a USB flash drive for this purpose, you can do so now, while it scans. The scan can take some time. When complete, the wizard displays available drives, as well as the minimum size the drive should be. If more than one is listed, click on the one you want to use, and then click Next. You’ll be given an important warning. The drive you use for your recovery drive (in this case, my USB drive) will be completely erased. Make sure there is no important data on the drive, and click Create to begin the process. This can take a surprisingly long time — at least it did for me. The length of time depends on the speed of your machine, your flash drive, your USB interface, and even what else you might be doing with your computer as the process proceeds. When completed, the wizard simply displays a message that it’s done. I’ll cover using the recovery drive in more detail in a later article, but the most important thing to realize is that it’s something you boot from. By that I mean you reboot your computer, so have your UEFI or BIOS configured to check for bootable USB media before booting normally from the hard disk. There’s more information on exactly what that means in my article How do I boot from CD/DVD/USB in Windows 8 & 10? Can I create rescue disks for any point in time? - You can indeed create rescue media to restore your machine to any point in time. Rather than calling it rescue media, though, it's nothing more than an image backup. How Do I Create a Windows 7 Password Reset Disk, and Why Would I Want To? - Windows includes a little-known and little-used feature that allows you to reset your Windows password if you've lost or forgotten it. There's only one catch: you need to prepare. « Previous post: How Do I Know If My Computer Has Been Compromised? Leo, First thank you for all that you do. 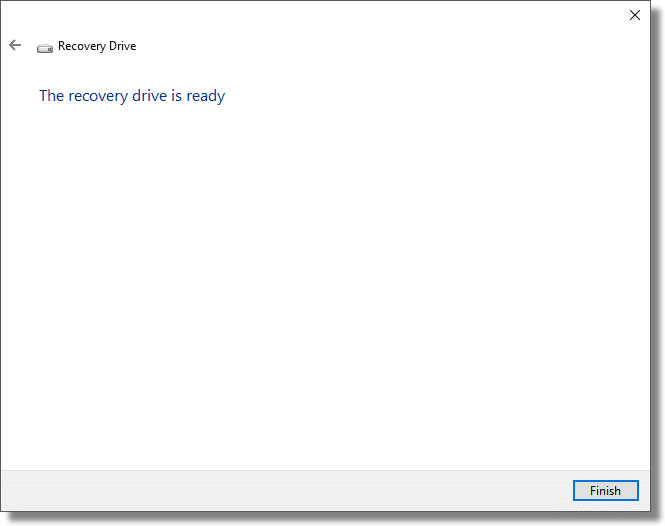 When will the discussion on how to use the recovery drive be available? I followed your directions to create the drive, and struggled mightily to find the way to change the BIOS startup order. However, it does not load from the Flash Drive even though it now is ahead of the HD in the sequence. Opening the Flash Drive reveals that it does not have the files I expected. Silly question: How do you store your USB once you’ve created it? Do you tape it to the desktop CPU? We have a laptop that we take into the field – I guess I could put the USB into an envelope, label it, and store it in the laptop case? Leo – Thanks for your help on these subjects – taking the pain out of the workflow! Thanks Mark – Your answer is very helpful – I was picturing a thumb drive, not an external hard drive. I do store the external hard drive backups in separate locations in case of a disaster. “The USB device you use should be an external hard drive.” – I could be mistaken, but can’t only flash or optical media be used? I can’t remember how I stumbled on to your page for information, but have since signed up, and just wanted to say THANK YOU for being such a wonderfully helpful man! You are so very nice to take your time to post and publish all that you do, and even send to subscribers for free. The information you give is so very helpful for those of us that are not so savvy to know what to do to keep our machines and individual information safe and working smoothly. Just wanted to pass along my thanks. I’ll be looking through your books to purchase for additional information. Question: DO I need to re-create the Recovery Drive after every major Windows 10 update, like Windows 10 “Creator’s Update” for example, or can I just make 1 Recovery Drive and never update it again? In other words, what’s really on the Recovery Drive. Bare-bones Windows 10 or an entire copy of the operating system? Very good question to which I would like to have the answer too. I recommend re-creating after major updates. The approach outlined includes a copy of Windows on the drive. Thanks Leo for your recommendation. That’s only logical when one considers all the CU (Cumulative Updates) Microsoft is throwing at us on a regular basis. Windows 10 has become an evolving OS. Seven hours! Even for Microsoft, this is a new low. On the same laptop, Pendrive Linux makes a bootable flash drive in about 15 minutes. Isn’t this the same process that one can do with Acronis True Image – backup to a USB hard drive and have a recovery CD available? Essentially, yes, this is how it’s done with many different backup tools. The deal is that these tools are already on your Windows 10 PC,and some are averse to gettign additional software. That’s an issue with your machine, then, I think. I’d talk to the computer manufacturer to see if they have one specifically for your machine.